PUNE: Candidates in the election fray are turning to lifestyle and diet changes to beat the rising summer heat. Congress candidate Mohan Joshi stresses on having a wholesome breakfast, followed by higher liquid intake throughout the day. “Once I am out in the sun meeting people, I rely more on coconut water and nimbu-paani (lemonade),” Joshi, who is contesting from Pune, said, adding that he tends to to eat light during the day. “If I indulge in heavy snacks, I make it a point to skip dinner that day,” he said. As for good night sleep, Joshi said he was able to sleep just for three hours on a given day now. For Supriya Sule, the Nationalist Congress Party (NCP) candidate from Baramati Lok Sabha seat, the routine has not changed much during the poll campaign. “Since I have been active in my constituency, my routine has not undergone any drastic change now,” she said. “As a member of Parliament (MP), I am accustomed to having a gruelling routine,” she added. However, as the temperature soars, doctors advise citizens and candidates to take utmost care to keep heat-related ailments at bay. “Fluid and electrolyte loss often contribute to heat cramps. 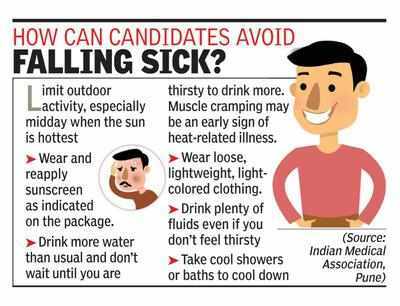 People who venture out without eating anything and stay in the sun during the afternoon may complain of heat-related exhaustion, including heavy sweating and weakness,” senior general practitioner Prakash Mahajan said. Not venturing out during the peak hours is one of the surest ways to beat the summer heat. “Candidates can avoid extreme heat hours, between noon and 3pm, by starting their campaigns early,” medical expert Sanjay Patil, president of the city chapter of Indian Medical Association (IMA), said. “However, since the elections are fast approaching, we have no option but to make the most of the time we are left with,” the Shiv Sena worker added.